Town midfielder Kingsley James is relishing his new-found freedom after scoring four goals in eight games since Darren Kelly’s appointment. The 23-year-old has already scored more goals this season than in any other previous campaign. Under Neil Aspin, James was used as a holding midfielder and rarely ventured beyond the halfway line. But he has been shifted to an attacking midfield role by Kelly and has been one of the Shaymen’s most consistent performers in the last few weeks, scoring against Cheltenham, Altrincham, Guiseley and Easteligh last Saturday. “It’s a bit unnatural for me,” he said, “although I was a striker when I was younger, I’ve moved back since then. “I’m enjoying it though. It helps having someone like Jordan Burrow up there to work off because I know every time the ball goes to him I can make runs and he’ll hold it up and bring me into play. “I’ve taken my chances when they’ve dropped to me and I’m producing my best football in that position. “I would like to stop there while I’m playing well but it’s up to the gaffer and I’m happy to play wherever he wants. James believes they were unfortunate to leave Eastleigh empty-handed on Saturday and feels Town’s style of play has evolved since Kelly’s appointment. “It’s different,” he said. “We’re playing out from the back a lot more and building passages of play more. “The more we do that the better we will get at it. “We were very good playing out from the back, especially in the first half, against Eastleigh. “In the second-half we made a mistake and let them off the hook but I thought we played really well. James believes the additions of the likes of Tommy Miller, Nat Brown and Nicky Wroe have helped improve performances. “We’ve added experience to the team which has helped take some of the pressure off some of the younger players, who were almost leading the team in a way,” he said. “We are a young team and we have looked naive at times this season. “So that experience has steadied the ship and helped us all relax. Despite Town’s better performances of late, James concedes they are in a ‘dogfight’ after a disastrous start to the season, something which he is at a loss to explain. “I honestly can’t put my finger on it,” he reflected. “It just didn’t seem to work - whatever team we played, whatever formation we used, it just wasn’t happening. “As a group we made a lot of individual errors which cost us in some games. “Even when performances were good we still weren’t getting results. And James admitted the club’s two hammerings against Cheltenham and Grimsby, when Town conceded seven goals in each game, left the side shell-shocked. “It’s the worst feeling in football,” he said. “It was embarrassing - for us as players and for the fans who’d paid to watch us. 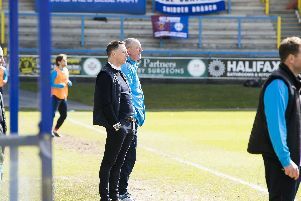 But after recent encouraging outings, James, who was part of the Chester team that knocked League Two Southend out of the FA Cup last season, reckons Town have a chance of causing an upset against Wycombe at The Shay on Sunday. He added: “If we play like we did at Eastleigh we’ve got a chance. “They’ll look at where we are in the table and think it’ll be an easy fixture. “But I think we’re a lot better than what the league table is showing at the minute but we’ve got to prove that.